Stems: Spreading to ascending, usually simple. Plants pubescent, not glaucous; sap milky. Leaves: Opposite; petiole .2 to .7 inch; blade lanceolate or ovate to oblong or obovate, .4 to 4.4 inches long, 1.2 to 3.6 inches wide, tip rounded to obtuse, sometimes truncate or notched. 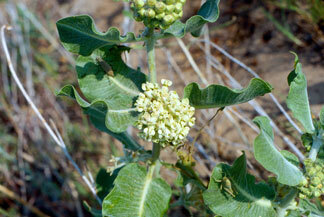 Inflorescences: Umbel-like cymes, 2-4, axillary, 25-50-flowered. Flowers: .4 to .6 inch long, .4 to .5 inch wide; calyx lobes 5, ovate-lanceolate, .2 to .28 inch; corolla greenish white or cream-colored, lobes 5, reflexed, lanceolate, .28 to .4; hoods 5, greenish white or cream-colored, strongly ascending, .14 to .16 inch, margins with 2 pairs of lobes, tip rounded to truncate; horns sickle-shaped, 1.3 to 1.5 times as long as hood, fused to lower half of hoods, abruptly incurved over anther head; gynostegium stipitate, .08 to .12 inch tall, .12 to .16 inch wide. Fruits: Pods, erect, broadly spindle-shaped, 2.8 to 3.6 inches long, .6 to 1 inch wide, smooth, glabrate or puberulent; seeds obovate, ca. .4 inch; tufted with white or tawny hairs, 1 to 1.2 inch long. Habitat: Sand and sandsage prairies, sandy mixed-grass prairies, riverbanks, and dunes. Comments: Asclepias, for Aesculapius, the Greek god of medicine and arenaria, "of sand".